Double means trouble in this game ... and triple is just as bad! Try to avoid matching dice! 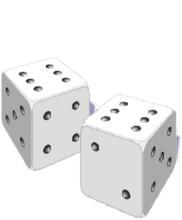 The first player throws three dice and if no doubles or triples appear, she adds the numbers thrown . She can then choose to throw again, or pass the dice on. If she chooses to "chance" another throw, the score continues to add up each time, unless a "double" or "triple" is thrown. Then she loses the total score for her entire turn. She can pass the dice on to the next player whenever she is satisfied, but must pass it on if she loses her points by throwing matching dice. The goal is to reach a score of 200 first (or whatever number you choose)!